The message was clear: Los Angeles was not afraid to reshape its urban form to accommodate the automobile. Over the course of a few months in 1931, workers cleared a wide swath through three dense downtown blocks, demolishing buildings, tearing up foundations, and filling in basements—all to extend an automobile thoroughfare, Wilshire Boulevard, from Figueroa Street to Grand Avenue. At $3.2 million, these were the most expensive 971 feet of roadway Los Angeles had ever built. This Haussmannesque project was part of a larger effort to extend Wilshire, which was then emerging as L.A.'s preeminent commercial corridor, into the central business district. Previously, Wilshire dead-ended 1.5 miles west of downtown at Westlake (MacArthur) Park. There, the city built an earthen causeway through the park's recreational lagoon. It also widened and renamed Orange Street, a narrow retail strip that ran between the park and Figueroa Street. This urban surgery might have improved traffic flow and hence pleased business owners along Wilshire, but it left scars. (Much as the road projects of a later generation would.) Property owners were slow to build storefronts along the downtown extension, leaving blank walls and open parking spaces to front the three new blocks. 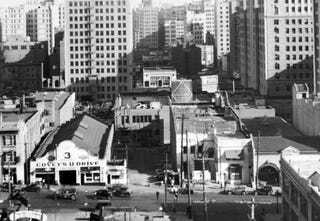 Above: Orange Street becomes Wilshire Boulevard. Before and after photos courtesy of the USC Libraries – California Historical Society Collection. The widening of what had been Orange Street also left wounds. Workers either tore down structures fronting the street, or, in the case of the Rex Arms apartment building, cleaved off the fronts of the buildings to accommodate the wider road. But by far the most painful—if not the most expensive—segment was Wilshire's extension through Westlake Park, one of the city's oldest outdoor retreats. When public officials gathered to celebrate the completion of Wilshire's extension on December 7, 1934, the causeway they stood upon had split the park's signature lake in two (the smaller of these two rump lakes has since been filled in) and injected the once idyllic scene with the steady hum of automotive traffic. Above: Officials celebrate the opening of the Wilshire causeway through Westlake Park in 1934. Photo courtesy of the Photo Collection – Los Angeles Public Library. Top animation created from these 1930 and 1934 photographs, courtesy of the USC Libraries – California Historical Society collection. Southland is made possible by a partnership between Gizmodo, the USC Libraries, and the member collections of L.A. as Subject. Written by Nathan Masters, the series explores the urban past of Los Angeles, including the lost landscapes and forgotten infrastructures that continue to influence the city we know today. A version of this post previously appeared on KCET.org as "Urban Surgery: How Wilshire Was Extended Into Downtown L.A."